Knitting Boucle Yarn - approximately 3 ounces. (This is a specialty yarn that seems to be between sport and worsted weight. scarf took about 1-1/2 skeins. R2: Ch3, turn. Dc in next 2 dc. (Ch3, sk 3dc, dc in next 3dc) twice. R3: Ch3, turn. Dc in next 2dc. 3dc in ch-3 sp. Ch3, sk 3dc. 3dc in ch-3 sp. Dc in last 3dc. R4: Ch3, turn. Dc in next 2dc. Ch3, sk 3dc. 3dc in ch-3 sp. Ch3, sk 3dc. Dc in last 3dc. Rs 5-64: Alternate repeating Rows 3 and 4. 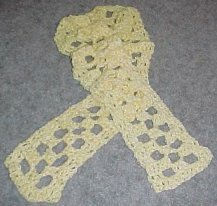 (You can make the scarf any length you want). Last Row: Dc in ea dc and place 3dc in ea ch-3 sp.